Hello, and welcome to the first “issue” of the KDE Brainstorm monthly digest. Let’s start by taking a look at the initiative as a whole. 323 valid ideas have been submitted in the last month, an average of 10.77 ideas per day. Quite a nice result, overall, especially knowing that non-valid ideas have been rather low, on that regard. Specifically, the staff has reported 15 invalid ideas, 28 duplicate ideas, 33 which were actually already implemented, 3 that were not ideas (more like bugs), and two rejected ideas. In particular, the last one was the first Brainstorm idea to be implemented by a KDE developer. Many thanks to Harald Hvaal for this! This month, the top voted idea was Easy, Beautiful Progress Notification in the Task Bar (by forum user Kubuntiac), an idea to bring Plasma progress notifications in the task bar, complete with a couple of mockups which make the text very clear. Kubuntiac stresses that it would not replace the current system tray based one, but instead to have an extra indicator. The reception of the user community has been quite positive, as this idea has 62 votes at the time of writing. Coincidentally, this idea is also the most discussed one of the month (25 replies). The community is heterogeneous, and some ideas are bound to be controversial. This month, the top controversial idea is Payment/donation to get bugs fixed (by forum user alberto.rossini) which although showing only 0 votes at the moment (result of opposing votes), has sparked quite a discussion about the impact (or lack thereof) of monetary donations to get bugs fixed for KDE. The community is clearly divided on this topic and the opinions are varied. Speaking of getting noticed, forum user TheBlackCat is our idea submitter champion for this month. When Brainstorm was created, TheBlackCat ported over many ideas discussed earlier in the Discussion forum, and also proposed quite a number of ideas on diverse fields (mostly Dolphin related). This is a time series of number of ideas for each day of the month. 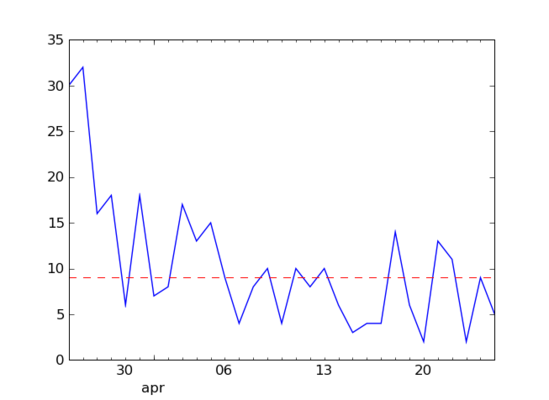 As we can see, the data is a little “noisy”, because the number of ideas posted have been fluctuating depending on the user submissions. The dashed line is the median of the votes in the considered period. We can see one big drop at the start, which was in my opinion “expected” when the novelty effect wore out. With ups and downs, however, the stream of new ideas has been more or less constant. If you would like additional statistics, feel free to suggest them in the comments. Did you like this digest? You didn’t? Let us know so we can improve it! « First KDE Brainstorm idea implemented!